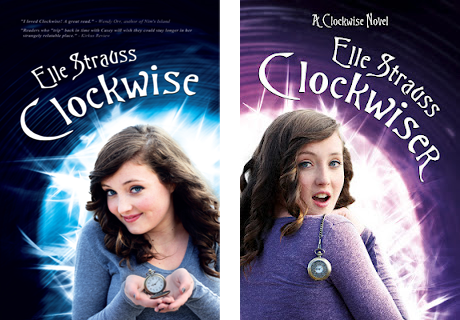 I am excited to share my review of Clockwise by Elle Strauss today as part of the Clockwise blog tour hosted by A Tale of Many Reviews, and I have a great giveaway for all my readers as well! Casey Donovan has issues: hair, height and uncontrollable trips to the 19th century! And now this — she’s accidentally taken Nate Mackenzie, the cutest boy in the school, back in time. Awkward. Clockwise is a whirlwind of fun that I enjoyed a lot. Casey is a wonderfully quirky character – a sarcastic, funny girl cursed with the ability to spontaneously time-travel to 1860, and forced to take anyone who she is touching at the time with her! The premise of the book is great, and it gets better with the introduction of the Wilson family – the wonderful caring people Casey stays with when she ‘trips’ back in time. The family relationships shown in the book are grounded in reality and wonderful to read. Casey’s family is dealing with the recent separation of her parents, and I think their experiences are accurately portrayed. Casey’s best friend Lucinda is great – I think it’s so good that she is supportive of the quirks in Casey’s life. The love interest Nate was a bit predictable, and aside from being really hot, I didn’t initially see why Casey liked him to much. But he proves to be a gentleman and I ended up liking him a lot. I enjoyed this book – it’s a short read and a perfect escape from the usual books I read. I am looking forward to reading Clockwiser, the second book in this series, soon and following Casey’s wacky adventures. Elle Strauss writes Young Adult and Middle Grade fiction. 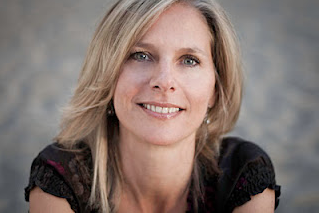 She’s a married mom of four, and lives in the beautiful Okanagan Valley, famous for beaches and vineyards. She’s fond of Lindt’s sea salt dark chocolate and hiking in good weather. Her Young Adult rom/com time-travel Clockwise series and contemporary/otherworldly Middle Grade It’s a Little Haywire are now available on Amazon. Elle Strauss has a Facebook page and a blog where you can subscribe to her newsletter. 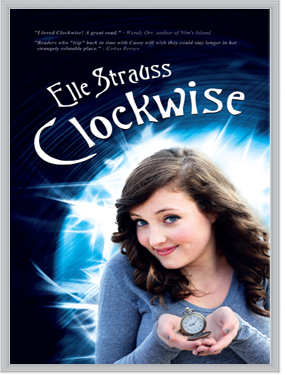 For the duration of the tour, Elle is lowering the price of Clockwise to $0.99 (USD) on Amazon and Smashwords. Elle is a member of a large writing group and thanks to the generosity of Elle and that group, each and every stop on the Clockwise blog tour will be hosting a giveaway. Each stop will be giving away one title from a member of the writing group and the grand prize will be a collection of all the titles plus Elle’s sequel to Clockwise, Clockwiser. 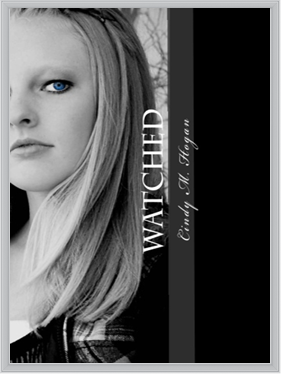 Speculating on SpecFic is giving away a e-book copy of Watched by Cindy Hogan! Change. She longs for it. It takes more than a school trip to Washington, D.C. to change Christy’s life. It takes murder. A witness to the brutal slaying of a senator’s aide, Christy finds herself watched not only by the killers and the FBI, but also by two hot guys. She quickly discovers that if she can’t help the FBI, who want to protect her, it will cost her and her new friends their lives. Sounds great doesn’t it? Head on over to my Facebook page to enter the competition! 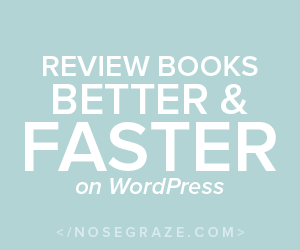 You can also add Watched to your Goodreads library, and check it out on Amazon. You can check out all the tour stops and their giveaways at the Clockwise tour schedule.